As I promised to myself – my work on Infinity The Game project continues. I made an agreement with my friend Jarek – that we will play Infinity at least one time before I leave Poland. Mine Bakunin Nomads against his Aleph. Jarek is perfect opponent for me – both of us are absolutely beginners. Maybe he has some more experience, he played few tutorial games – but still he is learning the games, its rules and strategies, so he will be at my reach and the game will be smooth and I’ll handle the events during the game on the tabletop. The best to learn and still get fun from it. So, Jarek, here I come! I think the very first game will be for 200 points. It’s little bit less than usual game of Infinity (300 points), but it will be just fine for the rookie like me. Still enough models to get familiar with schematics of the game and have jolly entertaining game. Maybe even more than one in the same evening. One Moderator with spitfire ( already painted) – here’s the link. 2 Reverend Custodiers (one already painted) – the link. One Prowler with HMG (cool model, still waiting to be painted). Is it a good list to fight against Aleph? Not a freaking clue…I don’t have any gaming experience, nor the sense of what tactical solution is the best against Aleph. I don’t even know exact stats or Bakunin and my Aleph enemies. What I’m sure is this will be nice game – and these models will provide me entertainment for entire evening:). Eventually I will expand my force and start to find most accurate tactics and models for Bakunin. Infinity is slowly becoming my No. 2 game right after Warhammer Fantasy. At least for now. As you can see above I have painted so far two models – Moderator with Spitfire and Reverend Custodier with Combi rifle. 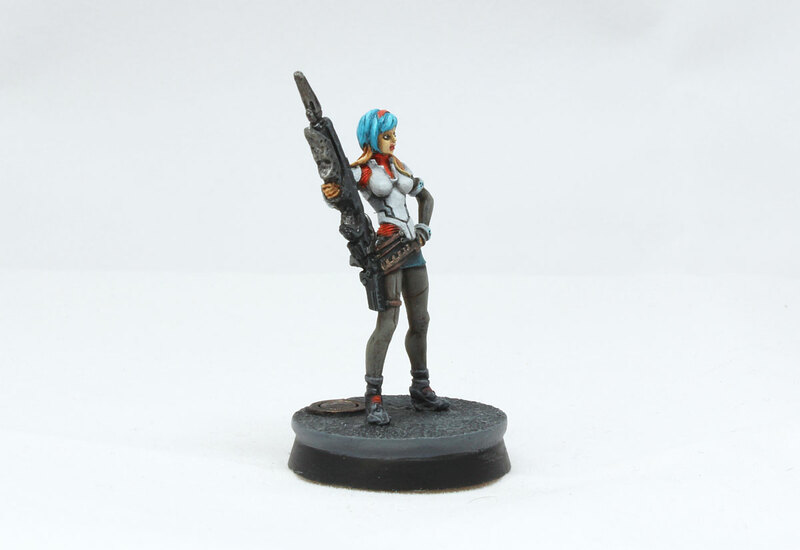 And now I’ve added one more – Moderator girl (miniature added to Bakunin Starter Box Set). …and she is lovely! No doubt about that! Skinny gal with blue dyed hair and…wait for it!…bunny ears and tail! My first thought was – what the f…? What kind of heresy is this? 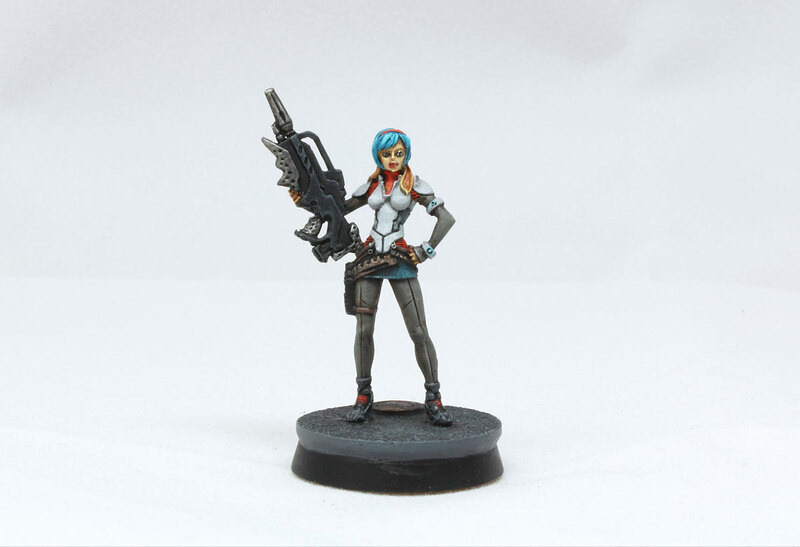 😉 …and I needed to get into Infinity Bakunin fluff in rulebook to check it out. After short research, few minutes later I knew everything. It’s simple. Genetic alterations are very popular among these Nomads – so apparently this girl added some bunny DNA to her human. And here’s the result. Bunny tail! Cute and awesome! I discover the tail and ears while painting the mini, not before I started. When miniature was primed with Chaos Black Spray – I did not recognize animals details. So imagine my surprise, when I was painting the face – and boom…I found ears! And shortly after – the tail during painting the skirt. Wow, crazy miniature, I must say! I had load of fun painting it. 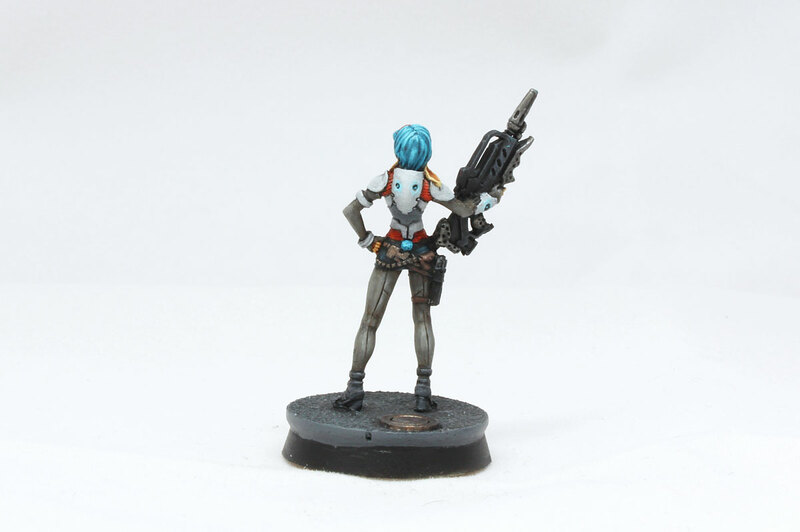 I painted hair with bright blue (Temple Guard), power suit with Administratum Grey toning into white, and clothes under the suit – Wild Rider Red and Troll Slayer Orange. The colours are typical for all Bakunin models. I slowly adjust to painting these – it’s becoming kind of the habit of mine. 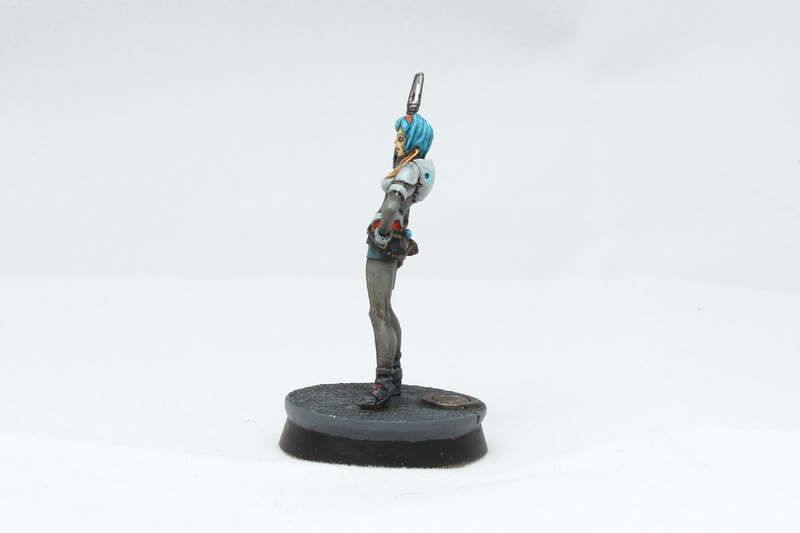 And that’s a good thing – every next Bakunin model will be much easier to paint:). As you probably noticed – the miniature is unnatural bended to the back. My first thought was to unbend it a little, but after that I started to remember old SF cartoons I used to watch as a kid – like G-Force for example. Postures of cartoon or anime characters are often not very natural – exactly like this mini. So after short consideration – I decided to left it like it is. Looks neat, if you ask me:). So, right now I have two Moderators, two more are in line to be painted and I’ll have core of my army ready. One of the models is a twin of this bunny girl. I plan to paint her hair pink – exactly the same like it’s on the blister picture. Can’t wait! Plans: few Skavens, few Infinity and some of Malifaux Neverborn. Exiting times ahead of me. And 21. October off I go down under! Very nice model & great painting dude… she got lucky with the mutations though, she could’ve ended up with massive front teeth!